In partnership with the Laberge Group, an Albany-based engineering firm, the UB Regional Institute participated in a research effort between 2008 and 2010 to review local and countywide highway service delivery for Chemung County and its 17 municipalities. The effort, which was funded by the New York State Shared Services Program, identified opportunities for cost savings, quality improvement and increased efficiencies in highway maintenance services across the central New York county. The final report considers service sharing as well as service expansion and consolidation. 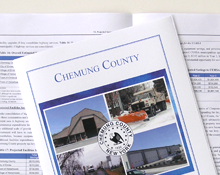 Chemung County had already taken a step forward in this area several years ago when it formed a Highway Services Board to oversee county and municipal highway services.